Want to get acquainted with ParaTweet? Let's look through some of the screens that you will be seeing while using the application. Once you have signed up for a plan you are ready to run an event. We have conveniently created ParaTweet events to mirror actual events. Whether that be a conference, concert, barcamp, nightclub, or church. Once you are signed up and logged in to your account you may create an event, or up to three if you have the corresponding plan. You can customize the title of each event and click the "Go Live" button to open that event's moderation page, the settings drawer will be pulled down on load. You can then change the settings for that event, anything you change in the settings drawer, as long as you click the "Save Settings" button, will stay the same until the next time you visit that event. Events are very flexible and can be used over and over again until your license expires. Each event has two sections; the ParaTweet display app and the event moderation page. These two pieces of ParaTweet are linked with a secret code which is unique to each and every event. It all starts with the moderation page. After signing up for a plan, you can create a new event and then be taken to a fresh moderation page. There you can add some search terms, a #Tag for your audience to respond to, and if you need it, an on screen question* or instruction. Enter search terms and #Tags. A secret code is given out for each of your events and upon loading the display app, you will be asked for this code. Enter an on screen question* or instruction for the audience. Enter a #Tag for your audience to respond to. With this checked, ParaTweet will not pull in any Tweets with profanity in them. "Save Settings" tab. Click this to close the live settings drawer and start moderating. Once you have set your parameters and hit the "Save Settings" tab you can immediately start moderating. As long as there are some recent Tweets out there in the interweb with the search terms you specified, you will start to see "Pending" tweets being loaded into the left panel. Note: in order to make sure you are pulling relevant results for your search, we limit the tweets to only the last hour and half. You can then reject or approve them, or hit the "Send to Approved" switch, which will automatically send them one by one on a timed delay into the "Approved" panel, instead of awaiting manual moderation. Once you have a few Tweets over in the "Approved" panel you can hit the "Live Display Control" play switch to start streaming your "Approved" Tweets to the live display application. "Pending" Tweets: these are Tweets that match the search criteria but are not yet approved. "Approved" Tweets: these are Tweets that match the search criteria and are approved either manually or automatically, depending on the style of moderation. These Tweets will begin to go to the live display application as soon as the "Live Display Control" Play switch is hit. Start or Stop live search for Tweets containing specified search terms. Go or Stop time-based auto sending of tweets to “Approved” panel. Play or Pause the live display application. Manual approve tweet button. This will send the Tweet straight to the Approved panel. The live display portion of ParaTweet is a small cross platform Adobe AIR application that we built. It is designed to be ran on a host computer connected to a projector, LCD, or CCTV, in full-screen glory. Install the Adobe AIR Runtime Environment directly from Adobe - latest version. this documentation if you need help with this step. Download the ParaTweet Display Application package, double click the downloaded file to unzip it, then install it by double clicking on the unzipped file. Upon launching the ParaTweet AIR application, you will be prompted for your events secret code. After submitting the code, the ParaTweet application will automatically go full screen to your primary display and wait for questions*, #Tags, and Tweets to be sent to it from the moderation page in real-time. That's it! You can now sit back and let the Tweets roll in, approving the ones you like, and rejecting the ones that don't quite fit. Your question* or instruction to the audience. The #Tag that you chose for your audience to use. Well, that's the basics. Feel free to dig in deeper to the other Info topics for the rest of the details. It's all about the Benjamins, eh? That's what we've been told at least, so here is the breakdown of our pricing. At the core of ParaTweet are some simple license purchasing plans. It's easy: you sign up, pick a plan and checkout. Our plans are monthly subscriptions of services, but don't worry - if you don't want to continue using a premium plan - simply downgrade your account in your account settings. Right now we have two plans to offer. Let's take an in-depth look at each of them. Roll over the listed items for details. The "Good" plan offers all the core features of ParaTweet: live moderation, auto or manual approval, profanity filter, multiple search terms, and a change on-the-fly #tag for the audience to interact with. With the "Good" plan you are limited to one event but you can reuse that event over and over again with new search terms and #tags for the length of your license. The "Great" plan builds on the "Good" plan and offers the very important ability to add a question or instruction at the top of the display application. This question or instruction is editable on the fly and will allow you to interact with your audience in a new and practical way. With the "Great" plan you can create three separate events each with different search terms and #tags that can be used simultaneously. Some common questions for people of all skill levels. What if all of my audience isn't on Twitter? Only people with Twitter accounts can interact with and respond to the live display. However, by projecting ParaTweet on a screen, non Twitter attendees can watch the screen and still benefit from the information shared. What happens if Twitter has issues when I use Paratweet? Is there a refund for accounts if Twitter goes down when Paratweet is being used? How long does it take for tweets to make it to the screen? Remember that there is a lag for users to turn their attention to a screen, understand what to do and then respond. For example, if a screen displays a question on ParaTweet, it may take an audience member between 30 - 60 seconds just to locate their phone and generate a response. Once a tweet is entered by a person, the time it takes to stream from ParaTweet to a screen generally depends on where the person entered the tweet from. SMS based tweets take longer to be received than do mobile application and web-based tweets. On average, it takes about 15 seconds for posted tweets to make it into ParaTweet. Is there a limit to the number of tweets (people) that can participate? There are no limits on people or the number of tweets allowed to be streamed into ParaTweet. What type of hashtag should I use for an event? With ParaTweet's live moderation, any #hashtag (search term) can be used. The moderation enables any irrelevant content from a #hashtag to be filtered out prior to being displayed. However, choosing a unique #hashtag for an event is always a good idea. A great way to test if a search term might be good, go to http://search.twitter.com and search for your potential #hashtag. If I need tech support, what do I do? Paratweet does not provide live tech support. Please reference the Info page for feature overviews, screenshots and technical requirements. Should you still need help, please contact support via supportATparatweetDOTcom. What is an account owner? How can I change the account owner on my ParaTweet account? The ParaTweet account owner is the person who originally set up your ParaTweet account. The account owner is the only person who can upgrade plans, change credit card billing information, and cancel accounts. To change account owners, the current account owner needs to go to the Dashboard and click on the "Account" tab. How do we update or change our credit card? The account owner can change the credit card used for any upgrade, add-on or extension of ParaTweet billing by going to the Dashboard and clicking on the "Account" tab. Once on the Account screen, click the "Payment" tab and make the appropriate edits for the new card. How do we upgrade our account? The account owner is the only person who can upgrade the account. Changing your plan is easy. Just click on the "Account" tab on the Dashboard and then the "Your Plan" tab in the sub navigation. You can upgrade from any level to any further level at any time. Upgrades take effect immediately. The amount difference between the new and old plans is charged immediately as well. Each account is billed for the term of its package and is non-refundable. There will be no refunds or credits for partial months of service, upgrade refunds, or refunds for months unused with an open account. In order to treat everyone equally, no exceptions will be made. You are responsible for whatever charges have been incurred. Should Twitter, an SMS provider, 3rd party application or any other service used in conjunction with ParaTweet falter during use, ParaTweet does not provide any refunds in such cases. Using ParaTweet is very easy, all you need is two computers (or just one with a secondary display) with reliable internet connections; one to run the ParaTweet display application and one to run the moderation page. It is designed to accommodate all normal screen and projector resolutions and will automatically detect and adjust when launched. How should I setup my system for ParaTweet? Can I run the moderation page and display app from one machine? Can I run multiple events with one ParaTweet display application? Yes, but not simultaneously, only one at a time. To switch to another event simply quit and relaunch the ParaTweet display app, and enter in the new event code. When you register for ParaTweet, we ask for information such as your name, event type, email address, billing address, credit card information. Members who sign up for the demo account are not required to enter a credit card. ParaTweet uses collected information for the following general purposes: products and services provision, billing, identification and authentication, services improvement, contact, and research. Cookies are required to use the ParaTweet service. ParaTweet uses third party vendors and hosting partners to provide the necessary hardware, software, networking, storage, and related technology required to run its services. Although ParaTweet owns the code, databases, and all rights to the ParaTweet application, you retain all rights to your data. ParaTweet may disclose personally identifiable information under special circumstances, such as to comply with subpoenas or when your actions violate the Terms of Service. ParaTweet may periodically update this policy. We will notify you about significant changes in the way we treat personal information by sending a notice to the primary email address specified in your ParaTweet account or by placing a prominent notice on our site. By using the paratweet.com web site and ParaTweet adobe air application (“Service”), all services of ParaTweet, LLC (“ParaTweet”), you are agreeing to be bound by the following terms and conditions (“Terms of Service”). ParaTweet reserves the right to update and change the Terms of Service from time to time without notice. Any new features that augment or enhance the current Service, including the release of new tools and resources, shall be subject to the Terms of Service. Continued use of the Service after any such changes shall constitute your consent to such changes. You can review the most current version of the Terms of Service at any time at: http://www.paratweet.com/info#terms Violation of any of the terms below will result in the termination of your Account. While ParaTweet prohibits such conduct and Content on the Service, you understand and agree that ParaTweet cannot be responsible for the Content posted on the Service and you nonetheless may be exposed to such materials. You agree to use the Service at your own risk. 1. You must be 13 years or older to use this Service. 2. You must be a human. Accounts registered by “bots” or other automated methods are not permitted. 3. You must provide a valid email address and any other information requested in order to complete the signup process. 4. Your login and account purchase may only be used by a single organization, person or entity – a single login shared by multiple events, conferences, venues, churches, people, organizations, companies, non-profits or other entities (all referred to here out as “Customers”) not under a singular use is non-permitted. The multiple “event” feature allows Customers to display three, separate streams that fall under the sole, legal entity of the actual Customer. 5. You are responsible for maintaining the security of your account and password. ParaTweet cannot and will not be liable for any loss or damage from your failure to comply with this security obligation. 6. You are responsible for all Content (Twitter or otherwise) posted and activity that occurs under your account (even when Content is posted by others via Twitter). 7. You may not use the Service for any illegal or unauthorized purpose. You must not, in the use of the Service, violate any laws in your jurisdiction (including but not limited to copyright laws). 8. You are responsible for any and all application downloads, as well as any and all effects of such downloads, required for the use of ParaTweet. 1. A valid credit card is required for paying accounts. 2. If you initially sign up for a Good, Great or any other account package, you will be billed up front and at the time that the account is created. 3. An upgrade from project plan (Good, Great or otherwise) to any other paying plan will end your existing plan and begin the new plan. You will be billed for the difference between the plans immediately upon upgrading. If a project plan is upgraded past the start of the existing account’s existing purchase, the fee for the difference of the account upgrade will be charged in full without being pro-rated. 4. The Service is billed in for the term of its package and is non-refundable. There will be no refunds or credits for partial months of service, upgrade/downgrade refunds, or refunds for months unused with an open account. In order to treat everyone equally, no exceptions will be made. 5. In the event that Twitter, SMS providers, Internet service providers or 3rd party applications experiences any hiccups, issues or downtime, no refunds or partial credits will be issued. 6. All fees are exclusive of all taxes, levies, or duties imposed by taxing authorities, and you shall be responsible for payment of all such taxes, levies, or duties, excluding only United States (federal or state) taxes. 7. For any upgrade in plan level, your credit card that you provided will automatically be charged the new rate. 8. Canceling your Service may cause the loss of Content, features, or capacity of your Account. ParaTweet does not accept any liability for such loss. 1. You are solely responsible for properly canceling your account. An email or phone request to cancel your account is not considered cancellation. You can cancel your account at any time by clicking on the Account link in the global navigation bar at the top of the screen. From there, click on the “Your Plan” tab and then the cancellation link provided. 2. All of your Content will be immediately deleted from the Service upon cancellation. This information cannot be recovered once your account is cancelled. 3. If you cancel the Service before the end of your current paid up plan, your cancellation will take effect immediately and you will not be charged again. 4. ParaTweet, in its sole discretion, has the right to suspend or terminate your account and refuse any and all current or future use of the Service, or any other ParaTweet service, for any reason at any time. Such termination of the Service will result in the deactivation or deletion of your Account or your access to your Account, and the forfeiture and relinquishment of all Content in your Account. ParaTweet reserves the right to refuse service to anyone for any reason at any time. 1. ParaTweet reserves the right at any time and from time to time to modify or discontinue, temporarily or permanently, the Service (or any part thereof) with or without notice. 2. Prices of all Services, including but not limited to license plan fees to the Service, are subject to change upon 30 days notice from us. Such notice may be provided at any time by posting the changes to the ParaTweet Site (www.ParaTweet.com) or the Service itself. 3. ParaTweet shall not be liable to you or to any third party for any modification, price change, suspension or discontinuance of the Service. 1. We claim no intellectual property rights over the material you provide to the Service. Your account info remains yours. However, by allowing the screen to be displayed publicly, you agree to allow others to view and interact with your Content. 2. ParaTweet does not pre-screen Content, but ParaTweet and its designee have the right (but not the obligation) in their sole discretion to refuse or remove any Content that is available via the Service. 3. The look and feel of the Service is copyright ©2009 ParaTweet, LLC. All rights reserved. You may not duplicate, copy, or reuse any portion of the HTML/CSS or visual design elements without express written permission from ParaTweet. 1. Your use of the Service is at your sole risk. The service is provided on an "as is" and "as available" basis. 3. You understand that ParaTweet uses third party vendors and hosting partners to provide the necessary hardware, software, networking, storage, and related technology required to run the Service. 4. You must not modify, adapt or hack the Service or modify another website so as to falsely imply that it is associated with the Service, ParaTweet, or any other ParaTweet service. 5. You agree not to reproduce, duplicate, copy, sell, resell or exploit any portion of the Service, use of the Service, or access to the Service without the express written permission by ParaTweet. 6. We may, but have no obligation to, remove Content and Accounts containing Content that we determine in our sole discretion are unlawful, offensive, threatening, libelous, defamatory, pornographic, obscene or otherwise objectionable or violates any party’s intellectual property or these Terms of Service. 7. Verbal, physical, written or other abuse (including threats of abuse or retribution) of any ParaTweet customer, employee, member, or officer will result in immediate account termination. 8. You understand that the technical processing and transmission of the Service, including your Content, may be transferred unencrypted and involve (a) transmissions over various networks; and (b) changes to conform and adapt to technical requirements of connecting networks or devices. 9. You must not upload, post, host, or transmit unsolicited email, SMSs, or “spam” messages. 10. You must not transmit any worms or viruses or any code of a destructive nature. 11. If your bandwidth usage significantly exceeds the average bandwidth usage (as determined solely by ParaTweet) of other ParaTweet customers, we reserve the right to immediately disable your account or throttle your hosting until you can reduce your bandwidth consumption. 12. 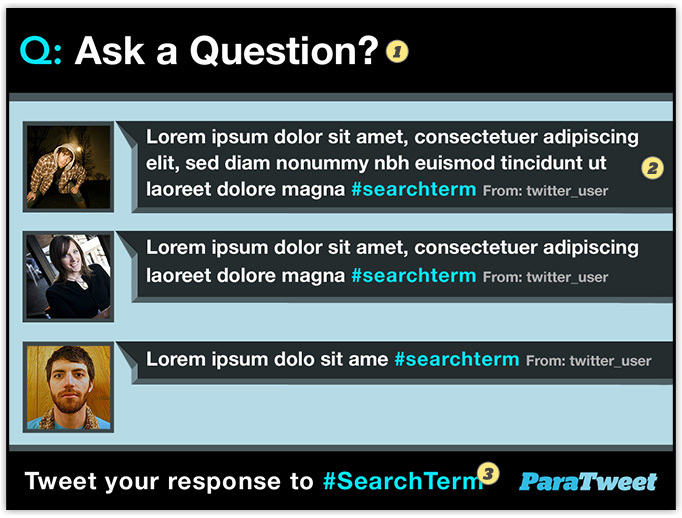 ParaTweet is dependent upon Twitter’s Search API for its data. If your requests to Twitter’s Search API significantly exceeds the average usage (as determined solely by ParaTweet) of other ParaTweet customers, we reserve the right to immediately disable your account or throttle your Twitter Search API requests until you can reduce your amount of requests. 13. ParaTweet does not warrant that (i) the service will meet your specific requirements, (ii) the service will be uninterrupted, timely, secure, or error-free, (iii) the results that may be obtained from the use of the service will be accurate or reliable, (iv) the quality of any products, services, information, or other material purchased or obtained by you through the service will meet your expectations, and (v) any errors in the Service will be corrected. 14. You expressly understand and agree that ParaTweet shall not be liable for any direct, indirect, incidental, special, consequential or exemplary damages, including but not limited to, damages for loss of profits, goodwill, use, data or other intangible losses (even if ParaTweet has been advised of the possibility of such damages), resulting from: (i) the use or the inability to use the service; (ii) the cost of procurement of substitute goods and services resulting from any goods, data, information or services purchased or obtained or messages received or transactions entered into through or from the service; (iii) unauthorized access to or alteration of your transmissions or data; (iv) statements or conduct of any third party on the service; (v) or any other matter relating to the service. 15. The failure of ParaTweet to exercise or enforce any right or provision of the Terms of Service shall not constitute a waiver of such right or provision. The Terms of Service constitutes the entire agreement between you and ParaTweet and govern your use of the Service, superseding any prior agreements between you and ParaTweet (including, but not limited to, any prior versions of the Terms of Service). 16. Questions about the Terms of Service should be sent to supportATparatweetDOTcom. Got an idea for ParaTweet? Some crazy mash-up, out there application, or something just plain fun?! We're always up for stuff like that (even if it leads to potential partnerships). Drop us a line and let us know at infoATparatweetDOTcom or follow us on twitter ! All text and design is copyright © ParaTweet, LLC. All rights reserved. is currently based out of Dallas, TX.